Sorry, no review of Yoshi's Safari yet. 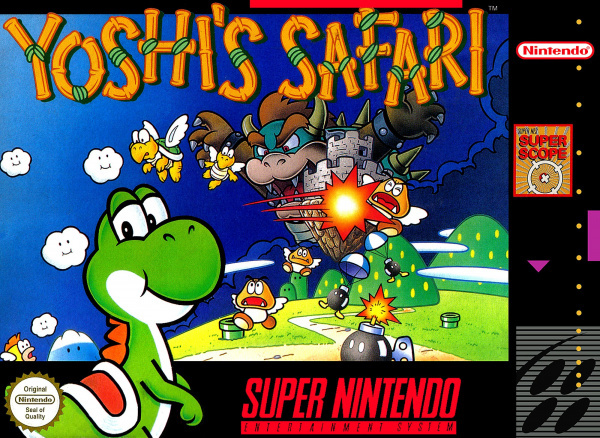 In Yoshi's Safari, Bowser, King of the Koopas, and his evil offspring have invaded Jewelry Land. The Koopalings have seized the Kingdom's precious jewels. It's up to Mario, armed with his trusty Super Scope, to ride Yoshi to track down Bowser and put a stop to his evil plans. Unusual for the Mario games, Yoshi's Safari uses a first-person perspective. Gameplay consists of shooting enemies before they attack. Hidden areas and other secrets can be unlocked by shooting at large gates. There are bosses along the way that must be destroyed before players can move on to the next area. Game supports single or multi-player game modes.